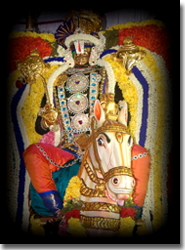 The Brahmothsavam for SriPadmanabha in Adyar takes place during the month of Feb/March in a very grand manner. 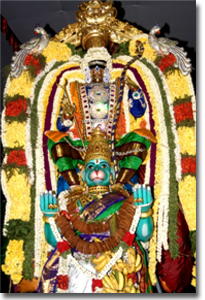 The festival begins with the SriGanapathy Homam and the proces sion of the Lord Sri Ishta Siddhi Vinayaka. 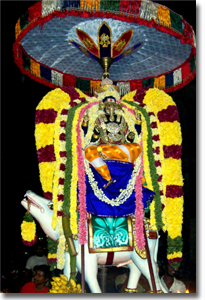 On the following day the "Dwajarohanam" (Kodiyetram) ritual is performed, offering prayers to Lord Garuda –the carrier of the Supreme Lord SriPadmanabha. This ritual marks the beginning of the Brahmothsavam festival. 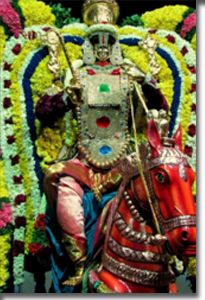 The Brahmothsavam is a 10 day long festival that is celebrated once a year. Every day the Lord SriPadmanabha graces through the streets of Gandhinagar in the mornings and evenings in various divine forms. 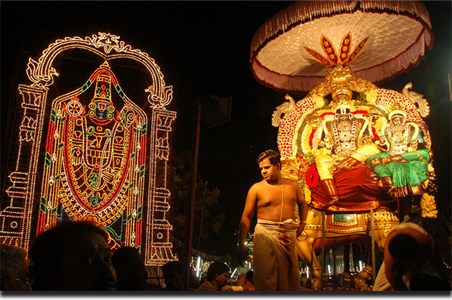 The "Garuda Sevai", "Thiruther", "Thirukalyanam" and "Theerthavari" are special events in this Utsavam. 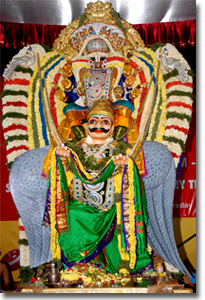 Naachiyaar Thirukolam, Raaja Sevay, Shesha Vahanam, and Pushpa Pallaku are other highlights of this festival. 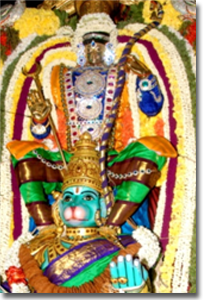 It is a true grand feast for our eyes to witness such great forms of SriPadmanabha. Every day evening special musical concerts and discourses also add to the divine flavor of this festival. On the final day of the festival, the ritual of "Theerthavari" is performed. It is believed that one will be absolved of all sins by taking a dip in the holy Theertham on this day. The celebration formally concludes with the "Dhvajavarohanam" (Kodiyerakkam). The Brahmothsavam celebration provides a unique opportunity for all devotees to participate in the festivities and experience divine bliss. It is said that those who witness the Lord during the Brahmothsavam festival will be blessed with everything great in life.